In this report an ability of parallel Polar data processing using cluster of Centrum Informatyczne Świerk (hereafter CIŚ) has been presented. Chapter two contain a description of testing environment in chapter three details of parallel calculation described. Chapter four and five presents respectively example (sort of how to) of CIŚ cluster using in context of Polar data analysis and results of conducted tests. In appendix A some useful commands has been described. Polar data testing calculation has been carried out in CIŚ cluster. The software used in mentioned analysis downloaded from official Polar software repository. Details about an access to Polar repository and about code compilation and needed library has described in previous report. The data used in tests came from first phase of Polar detector tests. This data can be found on Swiss server raidpolar1 in /RAID/polar/QM1/TestInit 20130829/data raw folder. The QM1 catalog contain 1075 files saved in binary format defined by CERN root framework (details about this format can be found at http://root.cern.ch/drupal/content/root-files-1). Those files contain 43 run of data acquisition, precisely 25 files *.root per each run. For all 43 runs following sequence of processing had to be done: pedestal subtraction, cross talk correction, energy calibration an data merging. The process program which can be found in /software/analysis/ProcessData/ in Polar repository is dedicated for mentioned sequence of analysis. fine path to place where results of data analysis should be write, path to process: determines the path to process program, and subset: contains number of subsets. The second function called prepdata() reads initial set of data and on the basis of names of *.root files it determines the number of acquisition queue (runs). The number of queue is a very important parameters because it determines the maximum value of subsets. On the basis of number of queue and the number of subsets third function called splittask() creates commands sequence which will call separate instances of procces program (one instance per one subset). Mentioned sequence of commands are writing into files (one file, one command) called ”taskX.sh”, where X is a successive number of file (or subset). The taskX.sh files will be a parameters for qsub command which requests resources of CIŚ cluster. Let’s assume that we want to make an analysis of Polar data which are in mentioned QM1 catalog in four parallel processes. Following steps should be performed. 1. Set parameters in configuration polarCIS.conf file. 3. Start task files on CIS cluster. To run tasks defined in task1-4.sh following commands need to be used. If we want to avoid typing four times above commands we can place them into some shell file. Then save this file as for instance run_tasks, then chmod 755 run_tasks and run it by ./run_task command. method of parallel analysis the time of whole process took about 2h05m. For comparison, Polar data processing was run on dedicated Swiss server and the time of whole analysis was order of 2 hours (precisely, 1h56m). 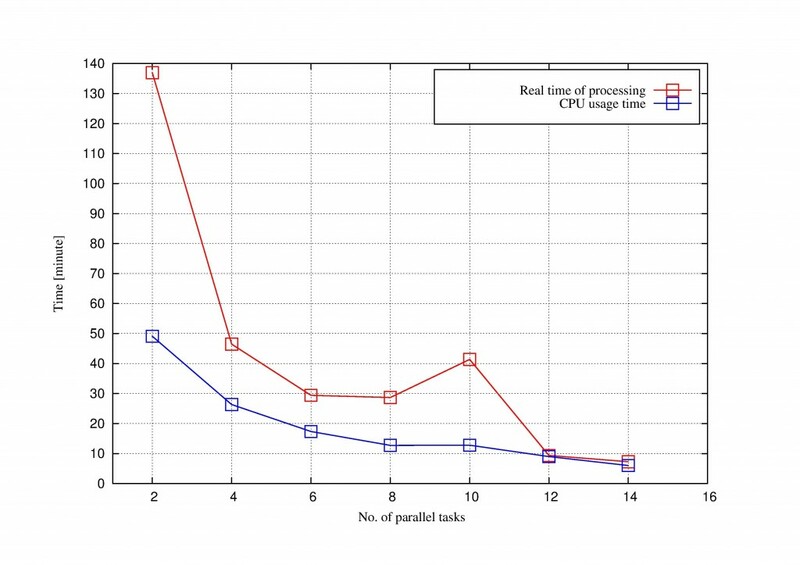 Figure 2: Real time data processing and CPU usage time vs. numbers of parallel processes. The initial set of Polar data was divided into several subsets. Initially it was divided into two subsets, then four and so on up to fourteen. The real time of processing and CPU usage time has a decreasing trend. However, when the number of subset has been set at ten, the real time of data processing increased compared to the previous value. Probably, one of the reason was high cluster load (many users used it). Below we present some useful commands which can be used during work with CIŚ cluster. This command will show some useful information about jobs requested by a given user. © 2019 PSAP — All Rights Reserved.